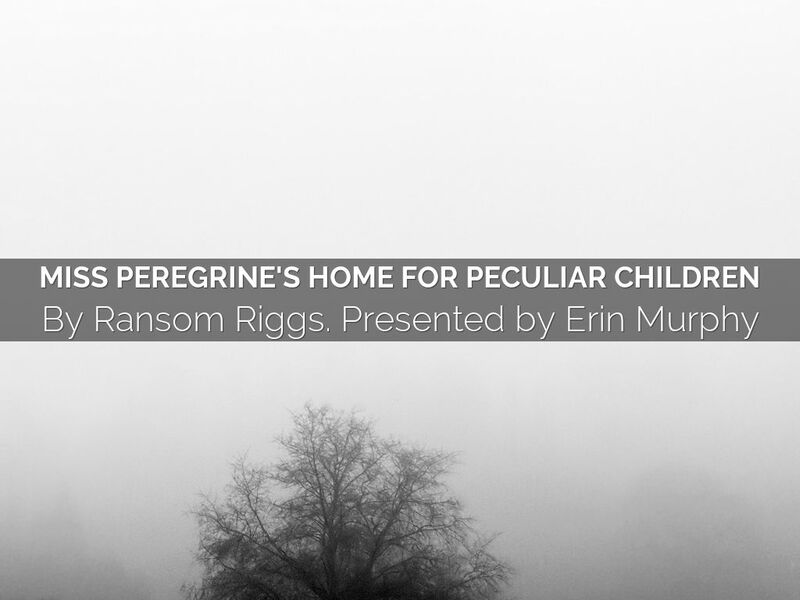 The book I chose to read was Miss Peregrine's Home for Peculiar Children, written by Ransom Riggs. The book takes the view from Jacob Portman. He's 15 years old, smart, but wimpy, like your typical nerd. He was born into a wealthy family but he doesn't ask for his parents to buy him nice things. Jacob often underestimates himself. ...less pathetic way of saying he was my only friend." 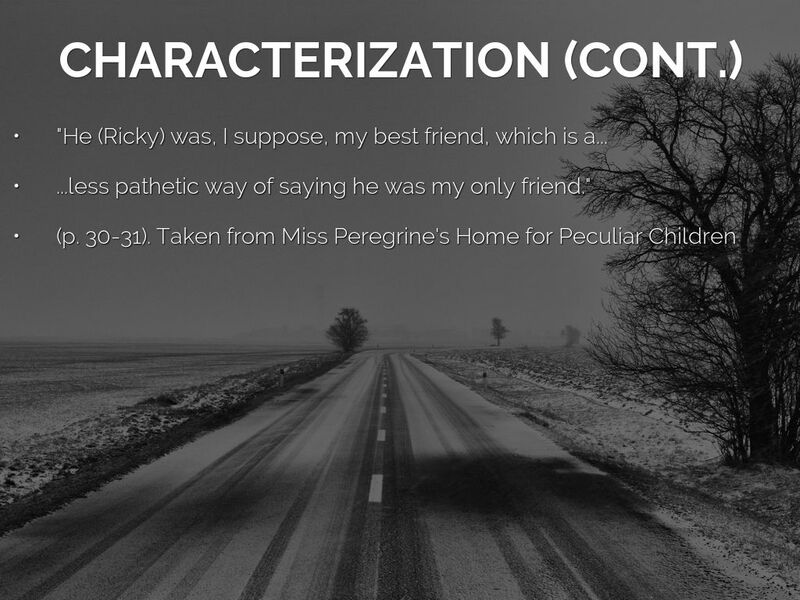 (Read quote) Jacob's only friend was Ricky. Ricky was a rebel and not smart. Their friendship was more of a give and take thing. Jacob would help Ricky with his homework, and in exchange Ricky would help Jacob not get bullied or beaten up. 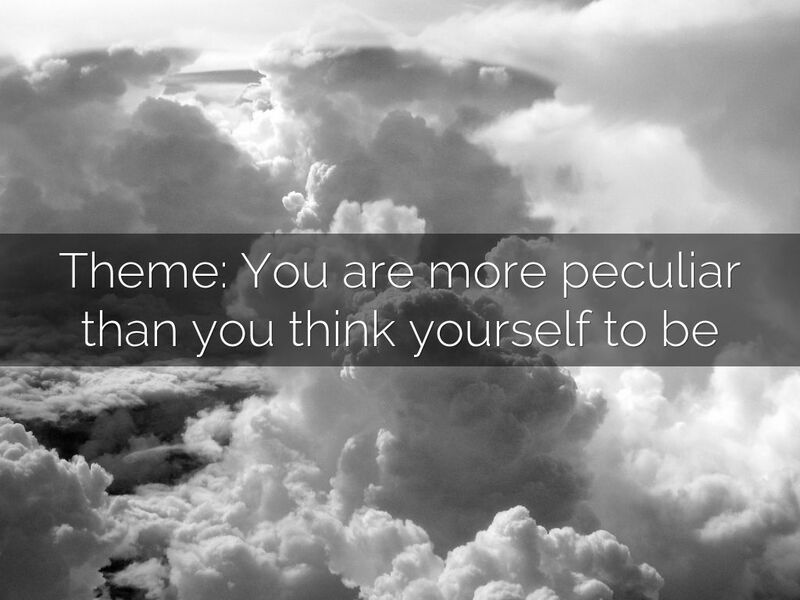 The theme for this book is you are more peculiar than you think yourself to be. 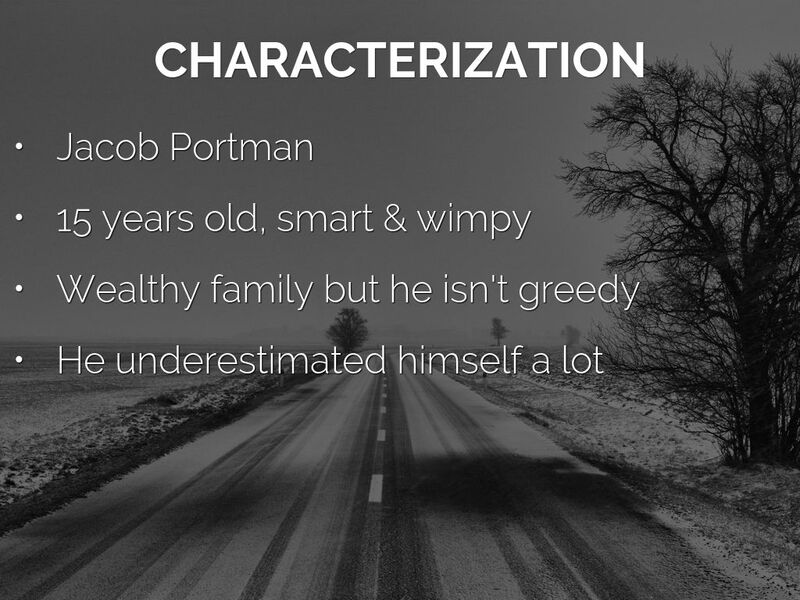 Jacob thought he was ordinary until..
(Read quote) Jacob thought he was ordinary until the death of his grandpa, the terrible thing, makes him realize he is peculiar. That, by the author's point of view, is a good thing. ...'and I mean that as the highest compliment'. 'I'd always known I was strange. 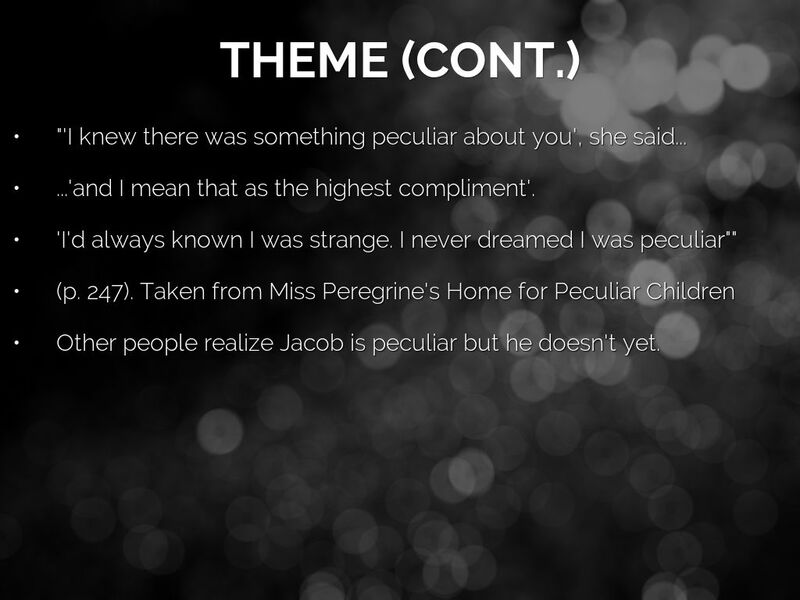 I never dreamed I was peculiar""
Other people realize Jacob is peculiar but he doesn't yet. 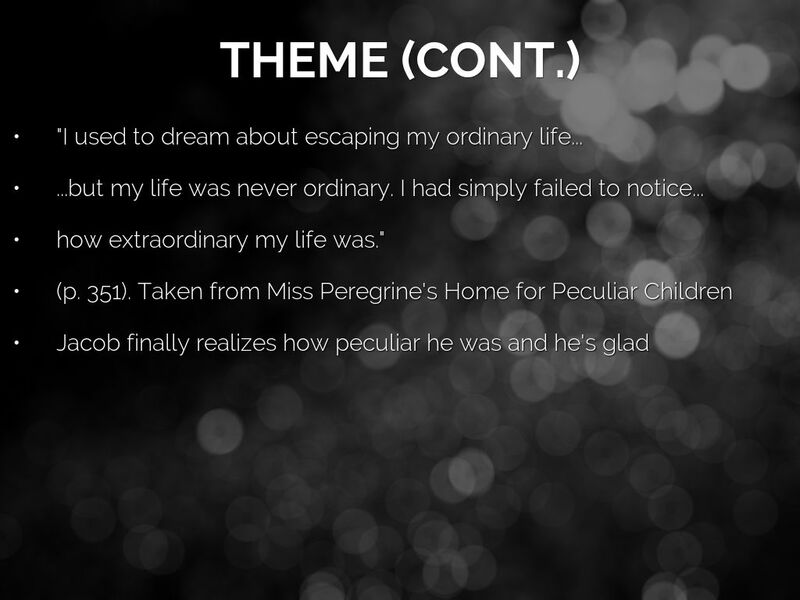 (Read quote) The other peculiar children can now realize Jacob is peculiar, but he cannot see it for himself yet. how extraordinary my life was." (Read quote) Now Jacob realizes he is peculiar and he has found the place where he fits in. 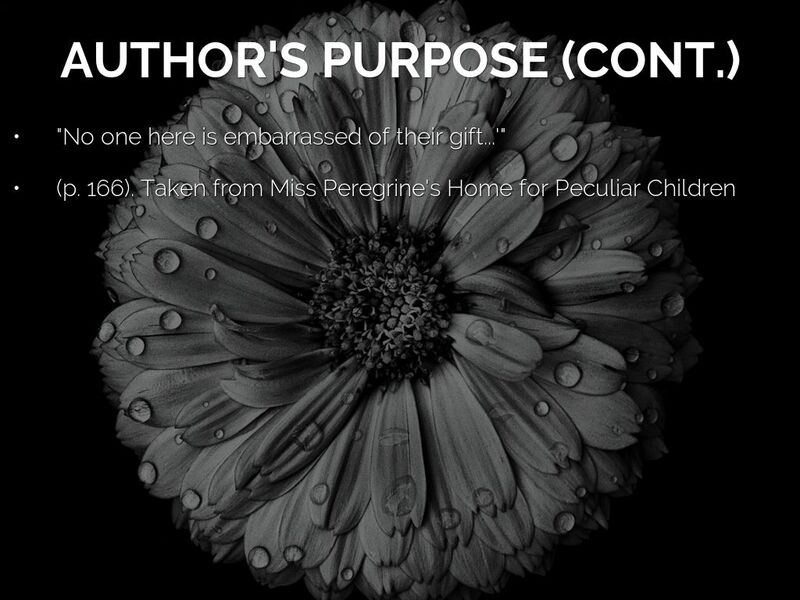 "No one here is embarrassed of their gift...'"
(Read quote) This quote is Miss Peregrine defending and protecting one of the peculiar children, showing them that there is no shame in being peculiar. This again shows the author's bias that being peculiar is only a good thing. This book was about a boy named Jacob. 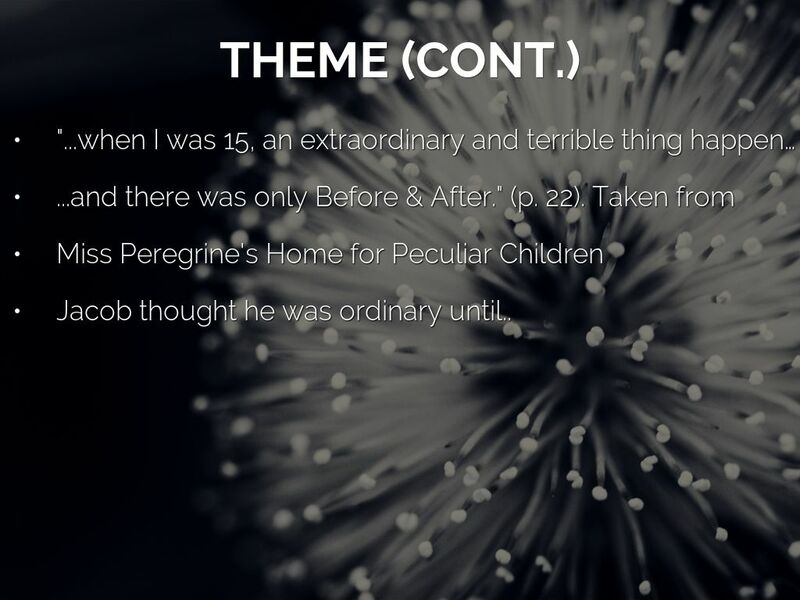 It defines peculiar children in a new way. It takes place at Cairnholm Island near Britian. 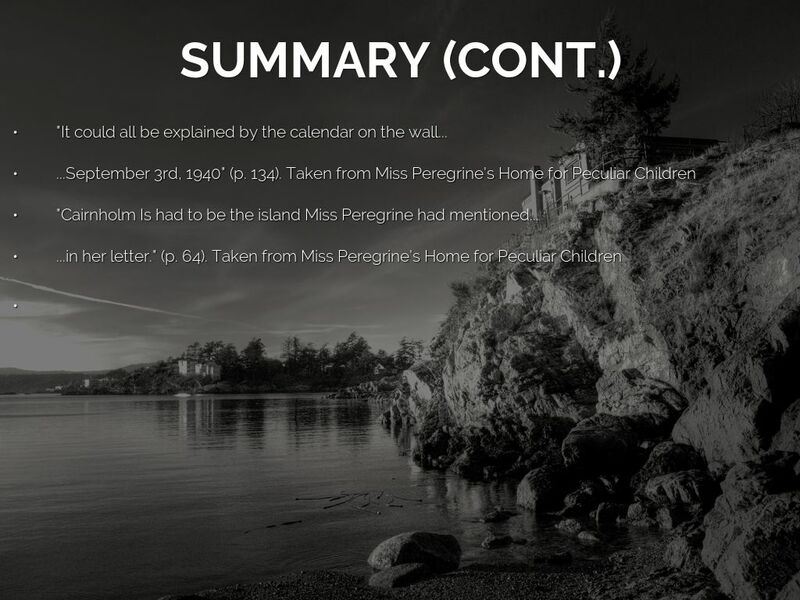 On the island, there is a time portal that only peculiar people can pass through which takes them to September 3rd, 1940 and stays on that day repeatedly, but outside the portal it is the present day. This book was written to show that being peculiar can be spectacular. This book incorporated photography which made it thrilling to read..
(Read first quote) This illustrates the time, September 3rd, 1940. 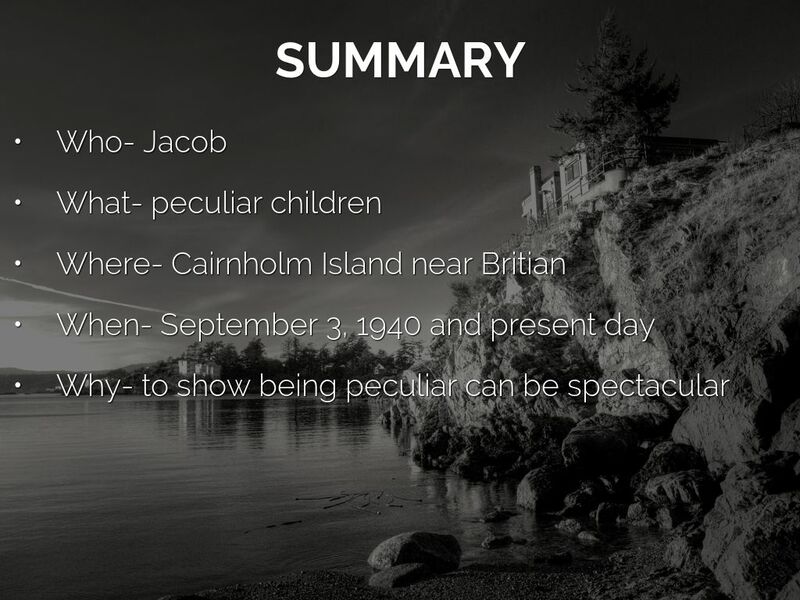 (Read second quote) This shows the place, Cairnholm Island. "As an attempt to placate me, it was pretty transparent" (p. 40). 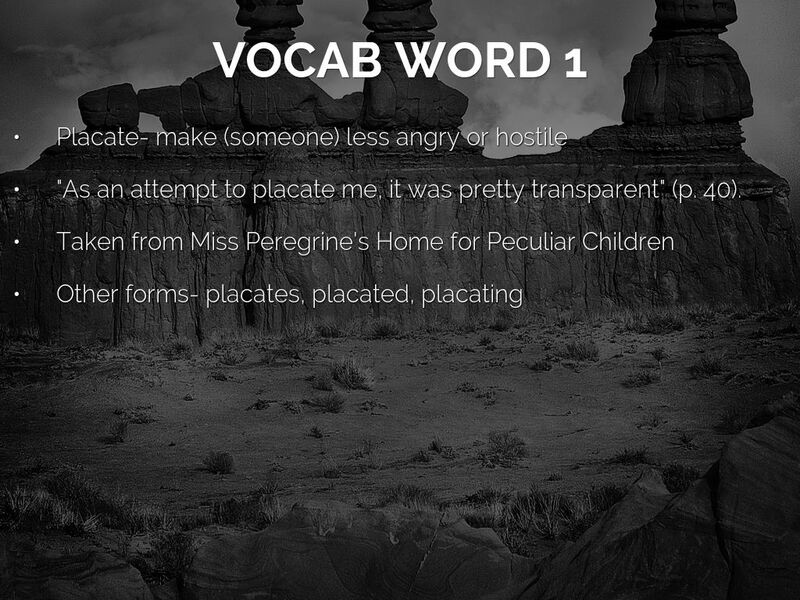 Placate is my first vocab words. It means to make someone less angry or hostile. (Read quote). 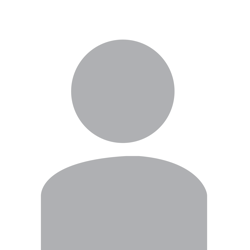 The other forms it may take are placates, placated, and placating. 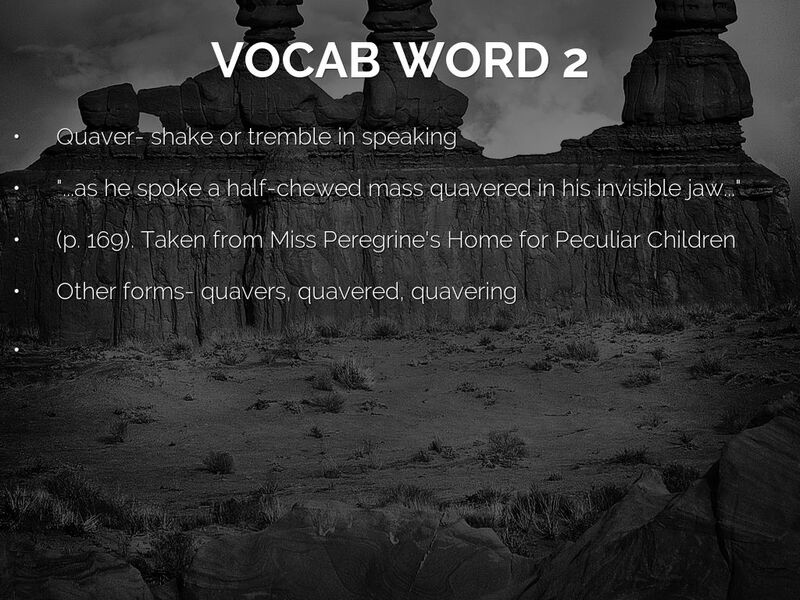 "...as he spoke a half-chewed mass quavered in his invisible jaw..."
My second vocab word is quaver, which means to shake or tremble in speaking. (Read quote). Other forms are quavers, quavered, and quavering. 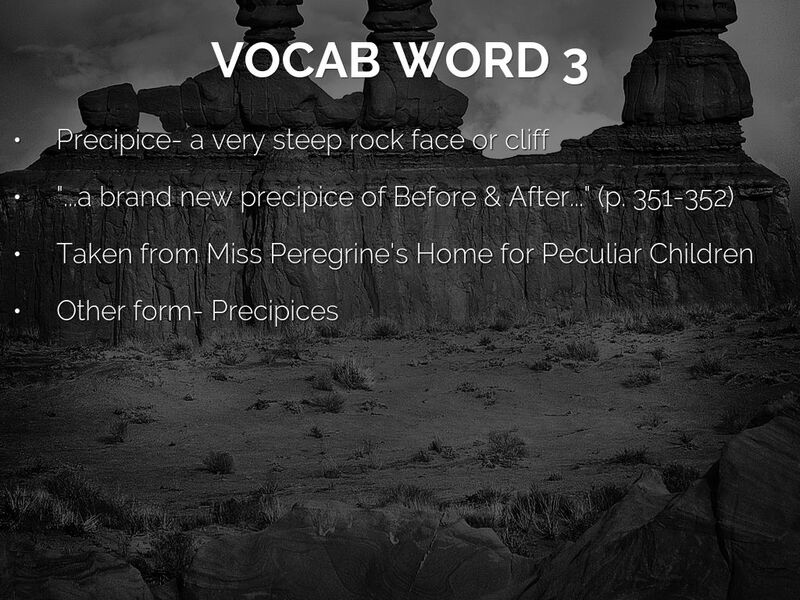 My third vocab word is precipice, which means a very steep rock face or cliff. (Read quote). Another form is precipices. I would definitely recommend this book for anyone who likes realistic fictions. 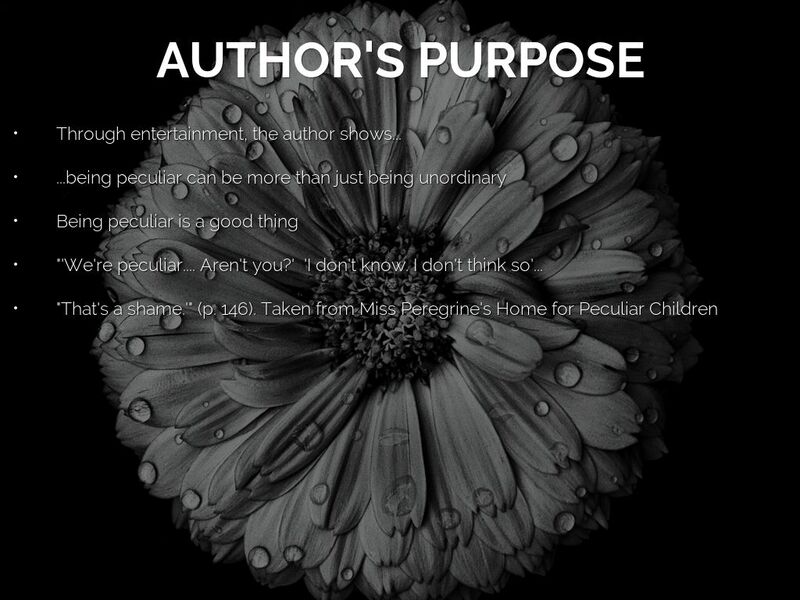 The book was very well written and the characters were developed well throughout the book. The book also had images which helped me picture and remember who was who. 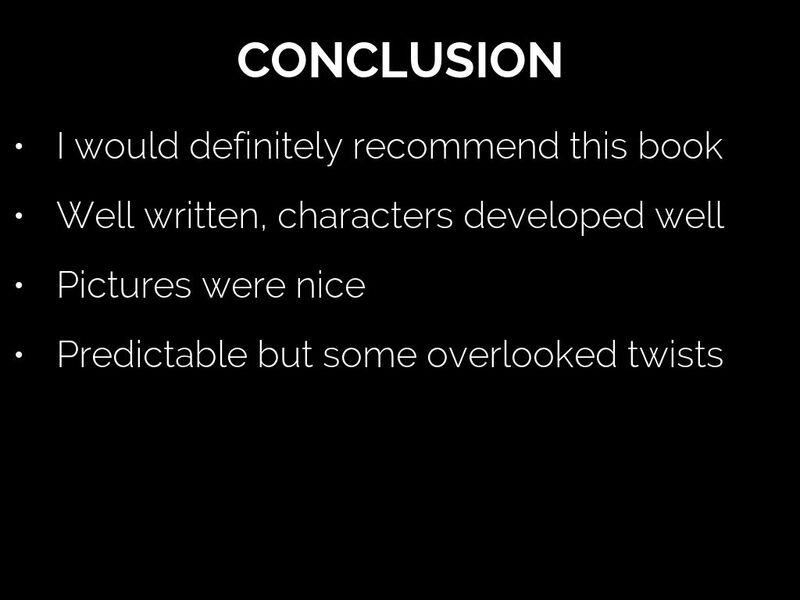 However, the book was a bit predictable, but even then there were some unseen twists that were added. 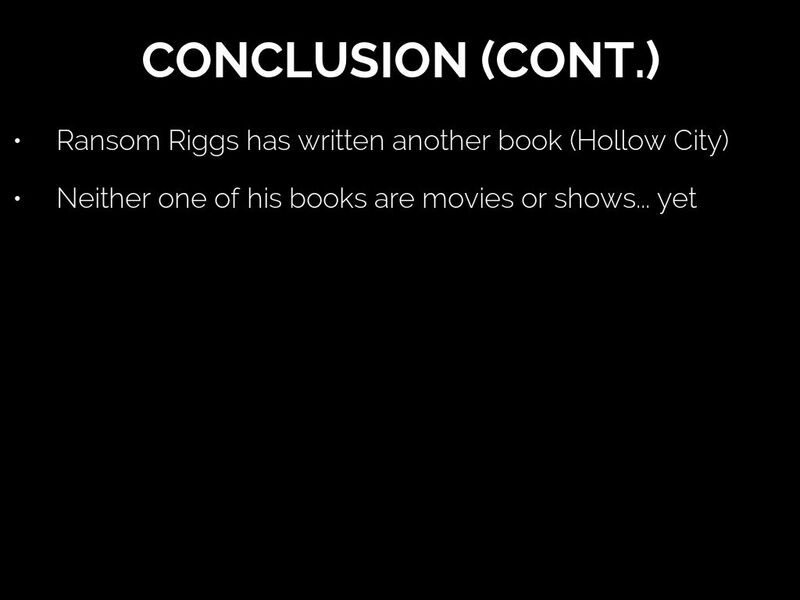 Ransom Riggs has written another book called Hollowed City, it is the sequel to this book, which was released earlier this year. Neither one of the author's books is a movie... yet.